Hair strand drug testing and analysis can provide a detailed history of drug use looking back from approximately one week before the hair sample was taken, up to the previous twelve months, assuming sufficient hair length is available for analysis. 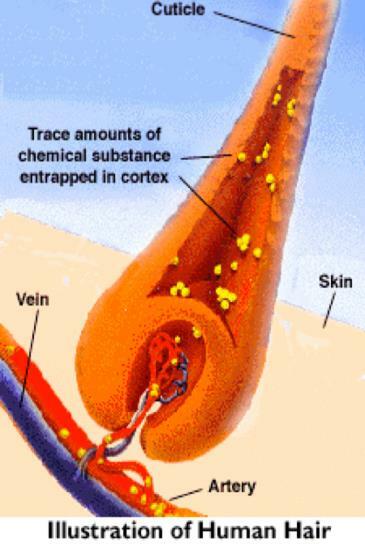 Drugs enter the hair through the blood supply in the hair follicle, the drugs become bound and fixed in the hair cortex as it grows away from the scalp. Scalp hair grows at an average rate of approximately 1 cm every 4 weeks. If segmentation of the scalp hair is applied prior to analysis a history of drug use builds up over time. Hair strand drug testing and analysis can therefore provide a detailed history of drug use up to approximately 5 days prior to sample collection, covering the previous twelve months, assuming sufficient hair length is available. A small sample of hair is cut from the scalp, approximately the thickness of a pencil. If a history of 3 months is required then a 4cm segmented section of scalp hair would be used, each centimeter of scalp hair providing information on a window of approximately 4 weeks. For each additional 4 week period an additional 1cm of hair is used. This provides an understanding of the historical pattern of drug use and whether use occurred prior to the period of interest or during this period. It can also show if use has increased, decreased, remained consistent or if there has been a period of abstinence throughout the required time frame.